What an Under Armour fitness center will mean to a celebrated work of art at 10 Light Street. A SPECIAL BREW REPORT. For decades, Marylanders have had an extraordinary work of art literally at their feet. 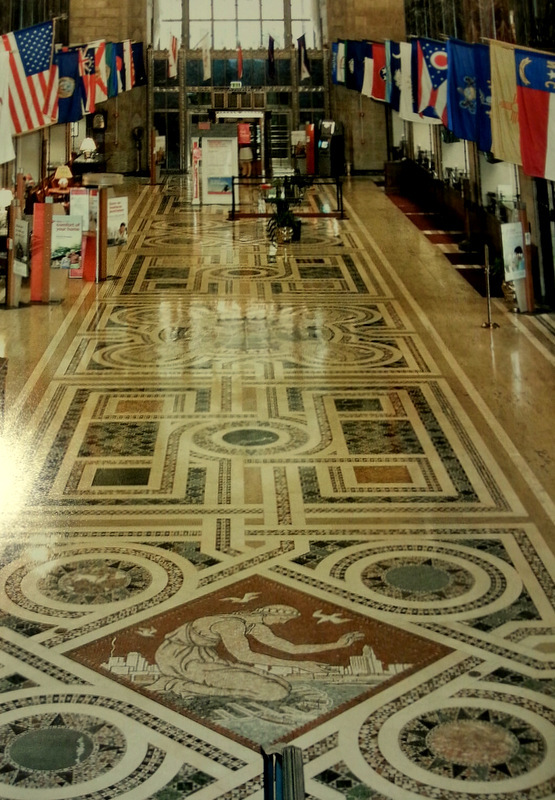 The historic banking hall inside the old Baltimore Trust Co. building at 10 Light Street contains a marble mosaic floor that features designs inspired by Baltimore’s industries, harbor and transportation. Created by the noted Maryland artist Hildreth Meiere, the decorative floor is as much a part of the 1929 Art Deco landmark as its wedding cake setbacks and gold leafed crown. It was the first corporate commission for Meiere, who went on to create works at Radio City Music Hall and other American landmarks and is considered one of the premier muralists of the 20th century. But this pioneering work by a nationally prominent artist will soon disappear from sight if developers move ahead with a plan to modify the banking hall as shown in recently released renderings. 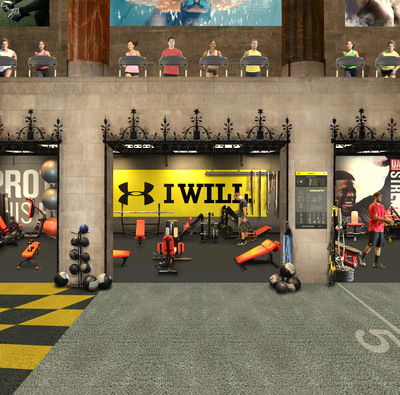 The renderings show the hall converted to an Under Armour Performance Center, a 35,000-square-foot fitness center that will occupy the building’s main banking floor and other areas near street level. Under Armour is opening the center with a partner, FX Studios, a company owned by Nate Costa, the personal trainer for Under Armour’s CEO Kevin Plank. In the renderings, the predominant color of the artificial turf is gray, compared to the vivid reds, browns, blues and golds of Meiere’s palette. The drawings depict performance center members exercising in the areas covered by the artificial turf – running, stretching, throwing balls against the wall. “Experience the union of Baltimore’s history and it’s [sic] thriving future by becoming a member of the Under Armour Performance Center powered by FX Fitness,” says the center’s website. Besides exercise space, the performance center will include a salon, spa, store and cafe, plus changing rooms, an area for physical therapy and more, according to the web site. Now under construction and scheduled to open by the end of the year, the center will be a tenant of the renovated building, whose upper floors have been converted to approximately 400 luxury apartments. The developer is Cary Euwer of Metropolitan Partnership in Reston, Va. According to Brian Goeken, chief of technical preservation services for the National Park Service, Euwer has indicated that the entire project, called 10 Light Street, represents an investment of $75 million. Euwer’s plan to convert the high-rise from offices to apartments has drawn praise from business leaders and elected officials for helping preserve the city’s only Art Deco skyscraper and for providing another place for people to live in the city. The Downtown Partnership of Baltimore honored Euwer for his efforts during its annual fall meeting. 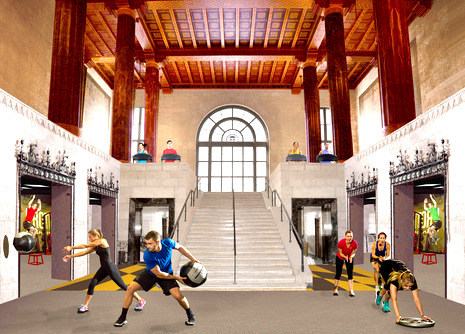 But the plan to convert the banking space to a fitness center – and then to cover the elaborate mosaic panels with “performance turf” – has sparked a debate among preservationists and others about appropriate ways to reuse historic buildings such as 10 Light Street. The Under Armour Performance Center has become such an issue in local preservation circles that CHAP, Baltimore’s preservation commission, asked Euwer to appear at its monthly meeting yesterday to address what chairman Tom Liebel characterized as “comments and rumors” about the way the interior is being altered to accommodate it. According to preservationists, the artificial turf will hide one of the building’s most significant architectural features and prevent visitors from seeing one of Meiere’s finest works – ironically, just as she is receiving renewed national attention in the form of a book and a traveling exhibit organized by the Baltimore Chapter of the American Institute of Architects (AIA). They note that Euwer has sought federal and state tax credits for preserving the building, and they argue that covering the floor runs counter to the spirit of using tax incentives to encourage developers to keep historic buildings open and their features accessible to the public. If the floor is covered, at least that means it’s not destroyed, Weeks said. Darrell Bishop, a Mount Vernon resident who follows downtown construction projects closely, questions the proposed use altogether. “A gym?” he said. “How about a nice restaurant? That was one of the most beautiful interiors in all of Baltimore. Its interior should be landmarked, so any alterations have to go through the landmarks commission. . . Hopefully, they have enough sense not to glue anything down” on the marble floor. On the Internet, commenters have expressed mixed opinions about Euwer’s plan to convert the banking hall to a fitness center. Still others, including Meiere’s daughter and granddaughter, point out that historic buildings such as 10 Light Street need rent-paying tenants in order to avoid the wrecking ball. They say Under Armour’s Performance Center will help make Euwer’s $75 million renovation an economic success, while protecting the original floor for future generations. If Under Armour and FX Studios need to cover the floor to make the space work as a fitness center and won’t damage or remove the mosaics, they say, they see it as an acceptable trade off. Then if the fitness center wants to move out at the end of its lease, they reason, the mosaic floor will be intact and available for the next tenant to display. Hildreth “Hilly” Meiere Dunn, the artist’s granddaughter and photographer for a book about her work, said she and her mother took a tour of the banking space with the fitness center’s architect this year and were told that the main banking floor would be covered with artificial turf, while the smaller floor of the Light Street entrance lobby on a lower level would remain uncovered. She said she was told the turf would be installed in such a way that it could be rolled back to reveal the mosaic panels if someone wanted to see them. 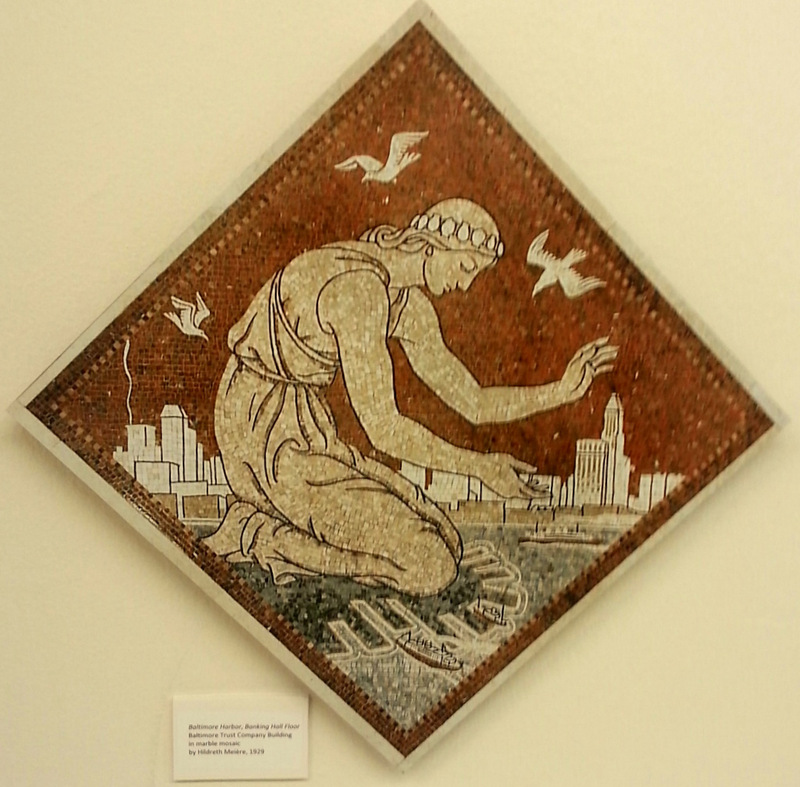 Dunn, who lives in Connecticut, said she is satisfied with that plan if it protects the mosaics for the future. She said the architect promised to select a color that would be appropriate for the space. At stake for the developer, meanwhile, are millions of dollars worth of state and federal historic preservation tax credits. Both the Maryland Historical Trust and the National Park Service have tentatively approved tax credits for the project – $3 million from the state of Maryland (the most the state awards for any one project) and an as-yet undetermined amount from the federal government (the exact amount depends on the final investment figure). According to Collin Ingraham, administrator of preservation financial incentives for the Maryland Historical Trust, the state tax credits are contingent on all construction work meeting Maryland’s standards for historic preservation. If a commercial tenant of the building makes changes that don’t comply with the preservation standards, Ingraham said, the landlord stands to lose tax credits for the entire project. 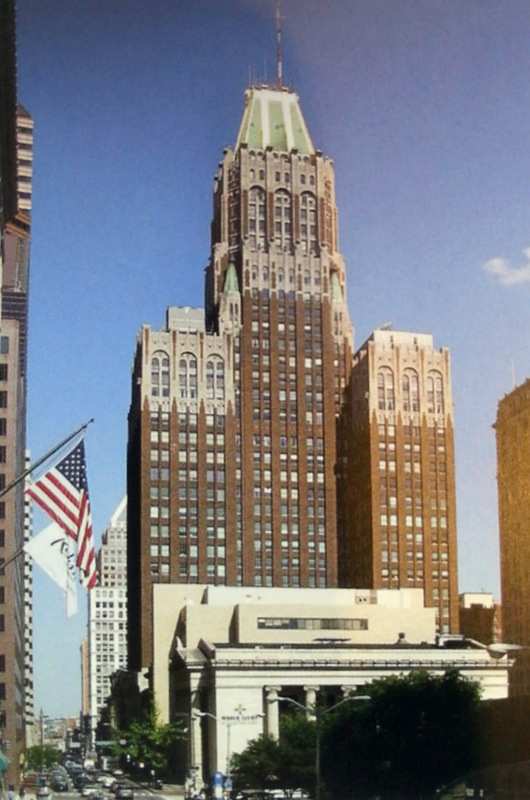 10 Light Street is one of Baltimore’s tallest buildings, and it has some sky-high rental rates to match. According to the building’s web site, a three-bedroom apartment on the 33rd floor is renting for $11,999 per month. A two-bedroom apartment on the 34th floor is going for $9,999 per month. More than two dozen apartments are going for more than $5,000 per month. Another 21 are in the $3,000 per month range. The lowest-priced apartment is a studio for $1,179 per month. Euwer, the building’s owner, said he knows all about the rules for preservation tax credits and what he has to do to get them. Covering the mosaic floor with artificial turf, he said, is no different than when the bank put down floor mats for customers to wipe their feet. He also pointed out that Dunn and her mother aren’t objecting to his plan. Ingraham and Goeken, from the Maryland Historical Trust and the National Park Service, said that they haven’t yet received information about the way Under Armour’s space is being altered and can’t say for sure whether it will jeopardize Euwer’s chances of receiving tax credits. 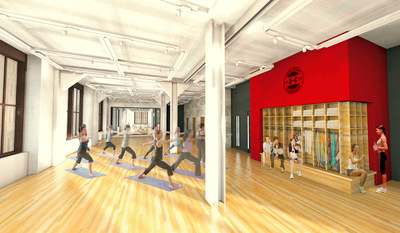 An exercise class at 10 Light Street under the Under Armour logo. Rendering from the FX Studios website. But Ingraham said the floor is a significant feature of the building and the method of covering it could be an issue in whether the building gets tax credits. He said the decision may come down to how the artificial turf is placed over the mosaic floor. If it is put down without adhesives such as mastic or nails that could damage the mosaic panels, in a process that is entirely reversible, that could be deemed acceptable, he said. But if the tenant intends to attach the artificial turf to the building in a way that is not reversible or would alter the condition of the mosaics, that would be more like replacing the floor entirely and could jeopardize the developer’s ability to receive tax credits, he added. How the situation is resolved, preservationists say, could be a landmark case that helps determine the way government agencies respond in the future to proposals for altering historically significant interiors. They say preservation guidelines were never written with the idea that someone might want to want to put a material such as artificial turf on a marble floor inside a former banking hall, and there is no language in the regulations addressing such a possibility. Waving a sample of the gray top layer at the panel, he said no glue will be used to install the new material and the marble mosaics will not be disturbed. Euwer told the panel that he believes part of the concern about the project is that people have referred to the new floor surface as turf – a term that Under Armour and FX Studios use in promoting the performance center to prospective members. Panel member Robert C. Embry Jr. asked Euwer if he would agree to allow the city to designate the former banking hall an interior landmark once the current renovations are complete, to give it a layer of protection for the future. “I would say we’d have a thorough conversation with you,” Euwer replied. Panel member Matthew Mosca asked why the bank’s original chandeliers don’t show up in the renderings of the fitness center. Euwer said the chandeliers were “photoshopped out to show the space, but they are in place.” In addition, “all of the stone walls are being restored,” he told the panel. In a separate conversation with The Brew, Euwer expressed confidence that he will prevail in securing historic preservation tax credits.